Enjoy reserved seats for TheRoyal Edinburgh Military Tattooon August 2 – 16 departures. Experience all stages of the whisky making process and sample a wee dram. Experience the beauty of Loch Ness as you relax on a cruise of this famous body of water. Close to both Edinburgh and Glasgow and 15 minutes from historic Stirling, DoubleTree by Hilton Hotel Dunblane Hydro provides a great retreat in a convenient location at Perth Road, Dunblane, FK15 0HG. Set within 10 acres of private grounds, this hotel combines Victorian style with contemporary comfort and a warm DoubleTree welcome with their famous chocolate chip cookie. CIE Tours’ guests will enjoy features like Wi-Fi, an indoor pool, a fitness room, a sauna, a steam room and a whirlpool. Indulge in a memorable meal at the hotel’s restaurant The Kailyard by Nick Nairn, with signature cuisine. This Dunblane restaurant specializes in seasonal local produce and stunning, simple dishes in a relaxed yet elegant atmosphere. Kingsmills Hotel and Spa, located at Culcabock Road, Inverness, is one of the top, luxury four-star hotels in the area. With a rich and diverse heritage dating back to the 18th century, complete with spa facilities, it is the perfect retreat for leisure holidays, and a world-class destination in its own right. Kingsmills Hotel provides the perfect combination of rest and relaxation with rejuvenating spa facilities, indoor pool, as well as a fully equipped gym. There’s never been a better time for CIE Tours’ guests to indulge in deep rest and relaxation. At the renowned St Andrews' golf course, this sophisticated golf and spa resort is an 11-minute walk from the British Golf Museum and 1.3 miles from St Andrews Botanic Garden. Refined rooms range in style from elegant to contemporary, and come with free Wi-Fi and flat-screen TVs. Some have balconies and/or views over the golf course. Suites add living areas, additional bathrooms and/or kitchenettes. 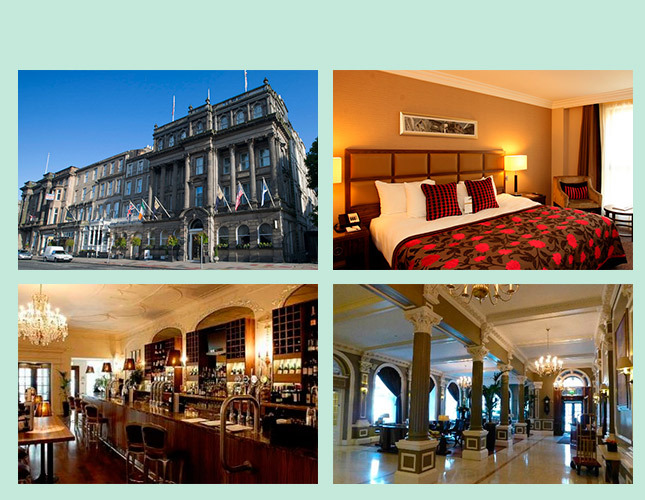 Set in the city centre, the George Hotel Edinburgh provides easy access to Edinburgh's popular shopping and sightseeing areas. This modern property is ideally located in New Town. Your tour starts with a traditional Scottish afternoon tea in your hotel in Dunblane, 40 miles north of Glasgow. Your beautifully restored Victorian-style hotel is set on 10 acres of private grounds and offers an indoor pool, fitness room, sauna, steam room and whirlpool. In the evening meet your tour director and fellow travelers for a welcome drink before dinner. 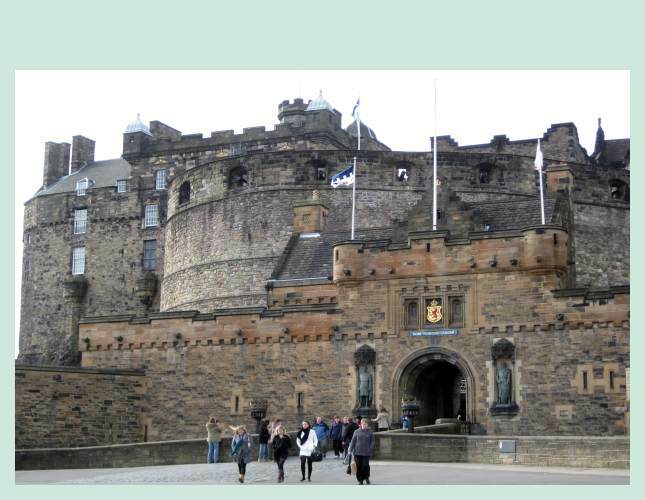 Travel to the historic town of Stirling to visit Stirling Castle. Captured in the 13th century from the English by William Wallace and then by Robert the Bruce, Stirling Castle has featured largely throughout Scottish history. 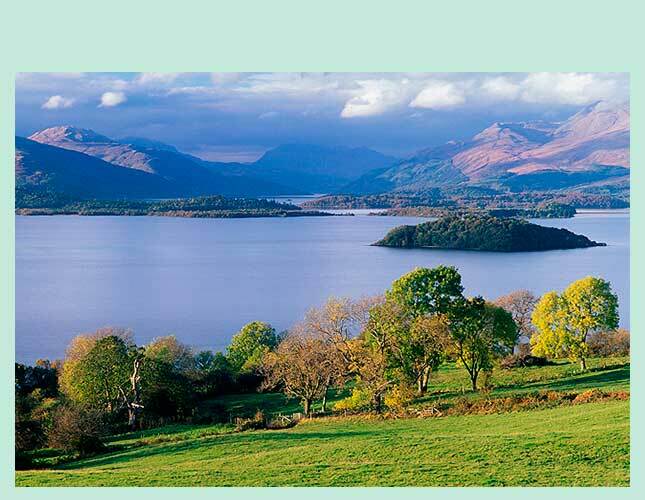 Drive through the stunning scenery of the Trossachs National Park before returning to your hotel for some leisure time before dinner. Drive across the haunting Rannoch Moor and through Glencoe, often considered one of Scotland’s most beautiful places. 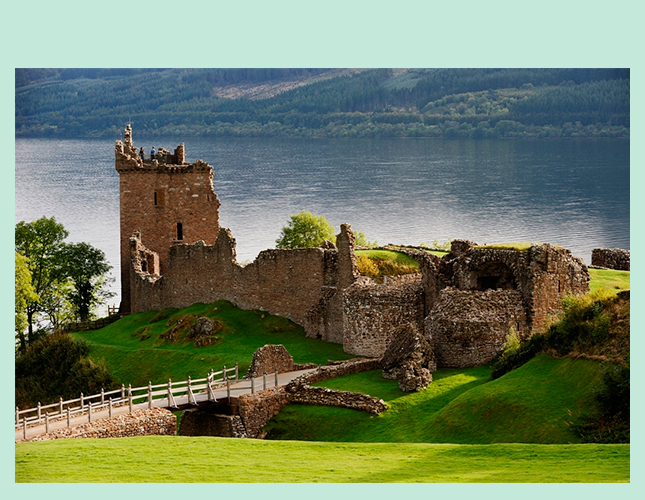 Drive along the scenic shore of Loch Ness and visit Urquhart Castle, once the largest in Scotland. Leave the castle and embark on a short cruise on Loch Ness to admire enchanting scenic views. Continue north to Inverness and check into your castle estate hotel. Discover the beauty of Cawdor Castle with its extensive gardens. This has been a family home for over 600 years and is the reputed place of the murder of Duncan, Thane of Cawdor, immortalized in Shakespeare’s play “Macbeth.” Visit Johnstons of Elgin to discover the 220-year-old story of Scottish innovation and luxury, and learn how local craftspeople have collaborated with generations of herding communities from Mongolia, China, Afghanistan, Australia and Peru to create the finest woolen and cashmere cloth and accessories. Next up is a visit to the Glenfiddich whisky distillery and experience all stages of the whisky-making process from mashing and fermenting to distilling and maturing – ending with a wee dram to sample. Enjoy leisure time before joining your group for dinner at your castle hotel’s fine restaurant. Travel through lush countryside to visit Glamis Castle, the legendary setting of “Macbeth” and childhood home of the late Queen Mother. This is a majestic building fi lled with priceless artifacts and furnishings, and you’ll enjoy a special tour. Drive across the Tay Bridge to St Andrews, the “Home of Golf.” Upon arrival check into the world-famous Old Course Hotel and enjoy some free time to settle in before dining with your fellow travelers. Embark on a guided walking tour to see the highlights of St Andrews, including the famous Royal and Ancient Clubhouse and the British Golf Museum. Visit St Andrews Castle and St Andrews Cathedral, which has been a site of worship since the 8th century. See the collection of medieval sculpture, carved stones, and other relics. 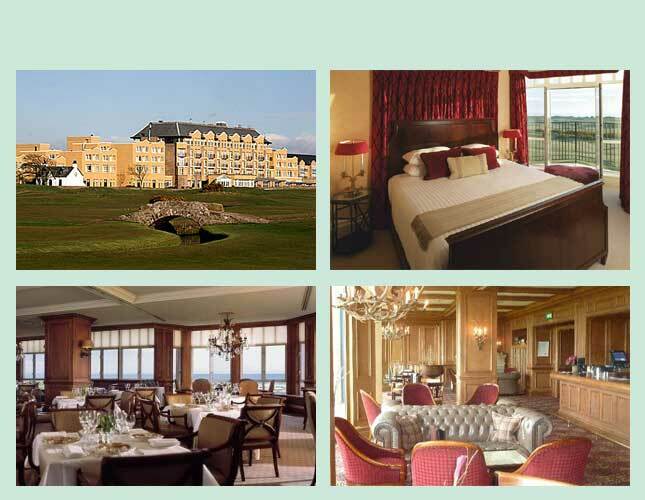 Or you may choose to enjoy a morning off in St Andrews for golfing or a spa visit. Drive across the Forth Bridge into Edinburgh, Scotland’s historic capital city. Enjoy dinner on your own in the city.